Twists can be used to great effect in disrupting an offense. Unfortunately, twists can also create gap control/pass rush lane issues for the defense. When a twist is called to the right place at the right time the result is defensive success. The challenge is getting the twist to the right place the highest percentage of the time. One solution is to have the defensive linemen read the twist to determine who will penetrate and who will loop. Torch is a read twist by the interior defensive linemen. TORCH stands for Tackles Read the Center. 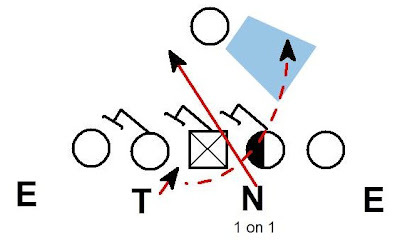 The DT's can be aligned in a heavy 3 and 2i, 2 head up 2's or in 2 inside shade 2i's to run the twist. Both DT's step initially inside and read the block of the center. Here the center is blocking toward the Tackle and away from the Nose. The Nose reads the center blocking away and continues to penetrate to the opposite A gap. The Tackle has the center blocking toward him and will use his hands on the center then loop over the top of the penetrating Nose. Here the Tackle reads the center away and penetrates. The Nose reads the center blocking toward and loops. Torch is an effective pass rush stunt. When the center pass sets toward the Nose the Tackle becomes the penetrator. This is a 1 on 1 inside pass rush against the guard for the Tackle. The initial inside step by the Nose holds the center's attention and prevents help by the center on the penetrator. Our Tackles beat the guard's block in this situation a percentage of the time. 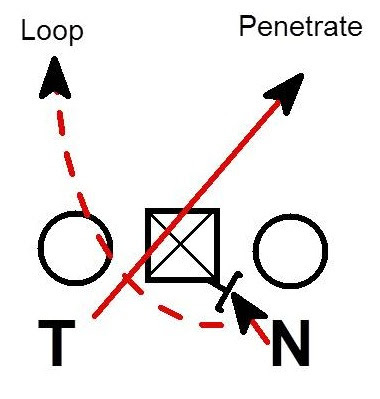 The rest of the time the Tackle's penetration disrupts the QB's footwork. 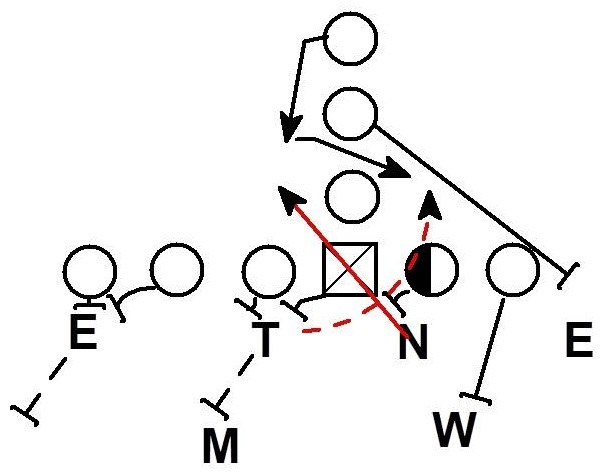 The QB has difficulty stepping up into the throw when the penetrator is on the midline. If the QB does not attempt to step up, the contain rushing DE's have a great opportunity to collapse the pocket. Often the QB's most viable option is to slide in the pocket away from the penetration. The QB feels open space to step into a throw or to use as an escape lane. As the QB slides into the open space the Nose loops into the same space and pressures the passer. When the center pass sets to the Tackle typically the offense is in some form of slide protection. The Nose now has the 1 on 1 inside pass rush. The Tackle will loop and apply late pressure on the QB as he slides in the pocket away from the penetration. Torch is also good against the run. Against zone blocking the center will block play side. 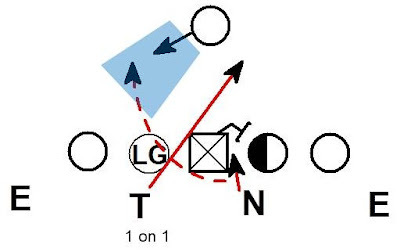 The penetration forces the running back to cut back directly into the looper. Torch is effective vs. the run and the pass. The negative is the investment time to get good at running it. 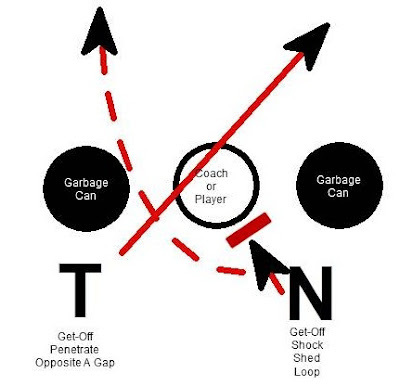 One simple drill we use to teach Torch requires two DT's, a coach/player , two garbage cans, and a hand shield. 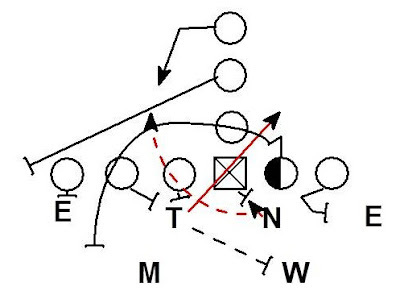 The coach lines up as the center holding the hand shield. The garbage cans stand in as guards. The Tackle and Nose react to the movement of the hand shield as the ball. 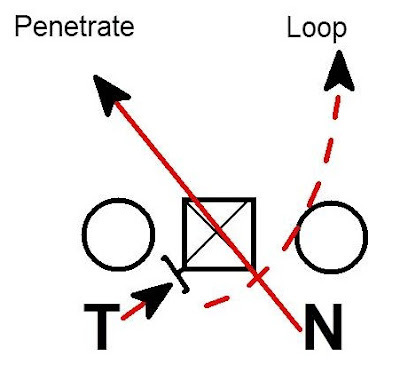 The DT's take their initial step then either penetrate or loop. In the first reps of the drill, I tell the DL where I am going to step. They know pre-snap if they are a looper or a penetrator. The focus on the reps where the DL know what is going to happen is the technique of the twist. Both DL must focus on get-off. When DL are first taught the Torch concept in install meeting they often equate reading the block with slow off the ball. We work hard to make sure they react to the ball and re-establish the L.O.S. on their first step when Torch is called. The other coaching point for the penetrator is to get to an aiming point in the opposite A gap. For the looper the key is to shock the hand shield and use great block shed technique before looping. The center is stepping toward you to block you. You must shock & shed before your loop. Once we get everyone reps where they know pre-snap what they are going to do, we transition into the DT's not knowing where the center will block. The DT's must now react to the center while maintaining great technique as in the early reps. I like to put a player at center on these reps. The drill is simple and very rapid fire. Every DT can get a bunch of reps in a 5 minute period of practice. Our defensive tackles have taken a great deal of ownership in Torch. I think they feel it is "THEIR" call in the same way a linebacker feels about a blitz. Torch is a nice addition to your arsenal if you are looking for a way to twist to the right place more often. 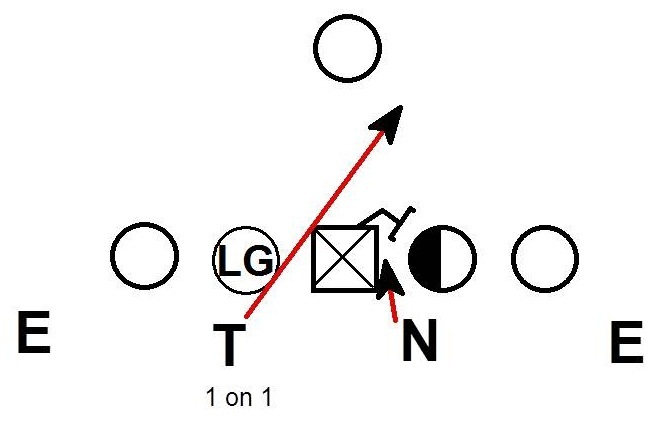 The 4-2-5 has evolved from two places the 4-4 and the 4-3 nickel sub package. The 4-4 background of the 4-2-5 provides great solutions for loading the box to stop the run as well as dealing with two back formations. 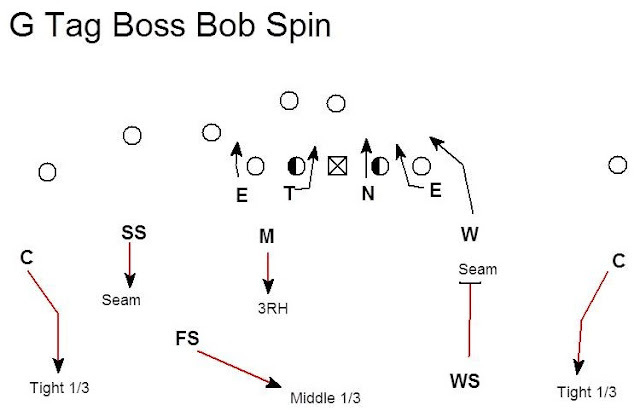 When dealing with spread formations however, it is often helpful to draw on the 4-3 nickel roots of the 4-2-5. The following zone blitz comes directly from traditional 4-3 thinking. This naming system is built similarly to the TCU concept of building sentences. Boss - The Backer or SS aligned to the back blitzes. In this case the SS is the blitzer. 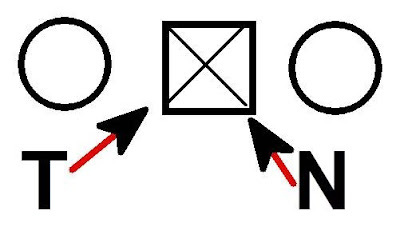 The SS must make a "Fire" call to tell the End to his side to go inside. The Backer who is aligned away from the back has the Seam. 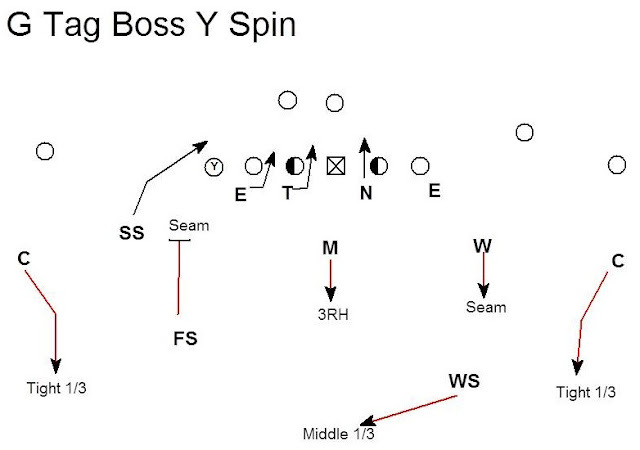 Here is the same blitz vs. a 3x1 formation. The only adjustments are the alignments of the inside linebackers. The Mike must widen his alignment to handle the 3RH drop. 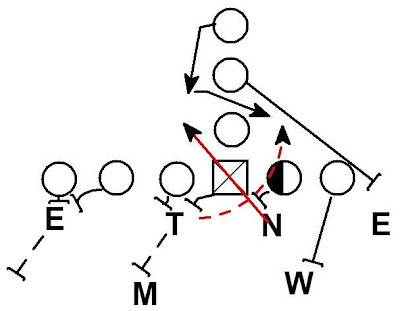 The Will can tighten his alignment to the core with no split #2 pass threat. The Will can now defend the open B gap opposite the blitz. If the back is aligned to the Backer (Will) the backer is the blitzer and the SS is a Seam dropper. The Will backer must make a "Fire" call to the end to his side telling him to go inside. The high safeties know the spin is going to the back. The Weak Safety spins down to the Seam while the Free Safety rotates to the Middle 1/3. In this example the blitz is now being run opposite the back (Bob = Blitz Opposite the Back). 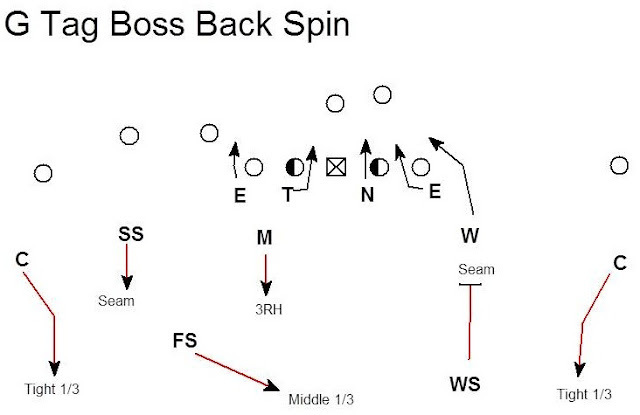 The Backer is opposite the back so the Will blitzes. The SS is aligned to the back making him a Seam dropper. The high safeties spin opposite the back. 1. 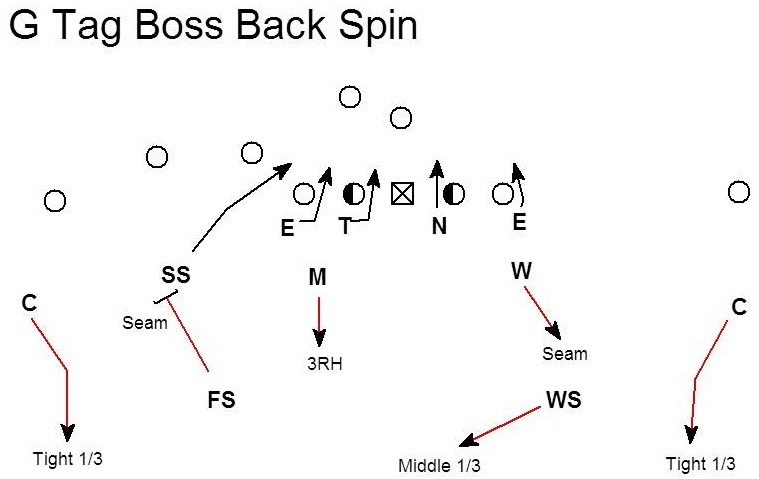 Where is the blitz coming from if the offense does not have an offset back (pistol or under center)? 2. 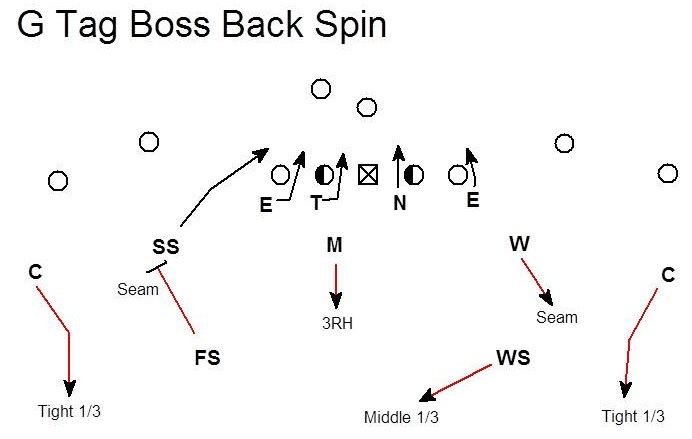 What to do if the offense moves the back? Can we reset the blitz or do we lock it on? The Boss concept can also be used vs. TE sets. In this example the blitz is being run to the Y or TE. All of the rules remain the same. The naming structure of building sentences is designed for a wristband driven defense. 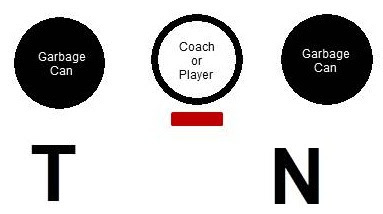 This system allows the defensive coordinator the flexibility to have multiple variable blitzes on any given wristband. The Boss blitz can be used to bring pressure where ever the defense wants to bring it with a simple tag word.